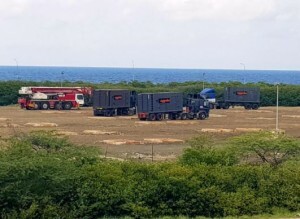 WILLEMSTAD - While there is still a court case pending against Aqualectra, Aggreko’s generators are already on the utility company’s property in Otrabanda. The company Dynaf believes that the entire process around the public tender did not go according to the rules and principles of equality. That is why they filed a lawsuit against Aqualectra for the way it dealt with the public tender. Yesterday the first Aggreko generators arrived on the island and are now already on Aqualectra’s property in Mundu Nobo. The court’s verdict on the case filed by Dynaf against Aqualectra is pending for today or Monday morning.